Methyl bromide is invisible. A toxic air pollutant, it can’t be tasted or smelled. But when exposed to the gas, the body knows it has been violated. Depending on the frequency and degree of the exposure to the compound, the lungs may fill with fluid or grow lesions. The kidneys, liver and esophagus can suffer. A developing fetus might fail to normally grow. And the brain: Like a fortress, the brain contains cells to repel substances from entering the sensitive organ. But methyl bromide can breach what is known as the blood-brain barrier. It storms the gates, potentially leading to tremors and other neurological damage. Now an influx of air permit applications for the use of methyl bromide has prompted the NC Department of Environmental Quality to approach the Science Advisory Board for guidance on setting exposure limits to the gas. Although the compound has been banned internationally, primarily because it depletes the ozone layer, it’s still legal to use methyl bromide to kill pests in logs slated for export to many countries, including China. 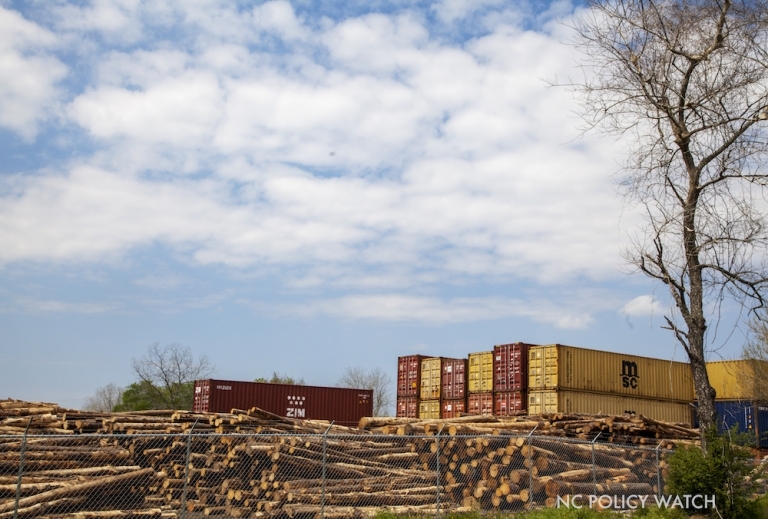 Companies fill shipping containers with logs timbered from North Carolina forests, then pump methyl bromide inside. After 12 to 72 hours, workers open the container doors, releasing nearly all of the gas into the air; methyl bromide can travel miles both up into the atmosphere and across land. DEQ is recommending a temporary draft rule setting a maximum level of 1 part per billion by volume (the unit of measurement used for gases), for chronic 24-hour exposure. DEQ used the only definitive EPA data, which is from the 1990s, to calculate the recommendation. Three other states used EPA’s figures in setting their standards. If the Environmental Management Commission next month approves the temporary draft rule — and if it becomes final — North Carolina will be the 23rd state to adopt its own threshold. A division of the Centers for Disease Control and Prevention, the ATSDR, published preliminary updated information this year, although it has not been finalized. In draft form, those conclusions mirror the EPA’s, said Sandy Mort, a DEQ environmental toxicologist. Several SAB members said that while the science currently supports DEQ’s recommendation, many questions remain about its protectiveness. For example, some people have a genetic predisposition to methyl bromide’s effects because of the presence of an enzyme. Pregnant women and children are also at risk. One proposed facility near Delco and Riegelwood in Columbus County is only one mile from a school. Workers at these facilities could also be at risk, said Woodhall Stopford, past director of the Occupational and Environmental Medicine Toxicology Program at Duke University. Although they are supposed to wear protective gear, including respirators, their exposure levels are still unclear. The instrumentation at the facilities might not detect low but nonetheless toxic levels of methyl bromide. The facility operators told DEQ they do not keep records of ambient air levels, Abraczinskas said. Technically, the Department of Labor, not DEQ, is responsible for environmental and health conditions inside the facilities’ property boundaries. “I suspect the board might like to look at workers,” said SAB Chairman Jaime Bartram. Malec Brothers, an Australian company, has proposed a log fumigation facility near Delco and Riegelwood in Columbus County, which would emit 100 to 140 tons of methyl bromide a year. Royal Pest Solutions, which has been fined for environmental violations in Georgia and Virginia, plans to build an operation in Scotland Neck in Halifax County, although it would emit less than 10 tons per year. Royal Pest Solutions is headquartered in Delaware. Renewable Green in South Mills, in Camden County, would also emit less than 10 tons annually. Pinnacle World Trade plans to operate in Williamston, in Martin County. Five existing facilities, each of which emits less than 10 tons of methyl bromide per year, have been notified that their air permits will likely be amended: RLS Log in Elizabethtown, Royal Pest Solutions in Chadbourn, plus two facilities in Wilmington, and Flowers Timber in Seven Springs.